The Blue Bombers were founded in 1930 as the Winnipeg Football Club, which has always been the organization’s legal name. Unlike most other professional teams in the four most popular North American team sports (but much more common in soccer, especially in Europe) the official legal name Winnipeg Football Club continues to see significant everyday use alongside its nickname, particularly in local media and especially when reporting on the club’s business affairs. Another unique aspect to the club compared to other North American professional sports teams (but also more common in Europe) is that it is organized as a corporation without share capital, meaning no one person or entity “owns” the team – while there are two other “community-owned” non-profit professional football teams in the CFL and one in the NFL, unlike the Winnipeg Football Club they all have shareholders. The 23rd Grey Cup was played on December 7, 1935, at Hamilton Amateur Athletic Association Grounds, with 6,405 fans in attendance. It marked the first time that a team from west of Ontario won the cup. The Winnipeg ‘Pegs defeated the Hamilton Tigers 18 to 12. The 27th Grey Cup was played on December 9, 1939, before 11,738 fans at Lansdowne Park at Ottawa. The Winnipeg Blue Bombers defeated the Ottawa Rough Riders 8 to 7. The weekend of the match saw very low temperatures so the night before the game the groundskeepers attempted to warm the playing surface by lighting hundreds of litres of gasoline, nevertheless, the field was frozen again the next day. The Canadian Football League’s 29th Grey Cup was played on November 29, 1941, before 19,065 fans at Varsity Stadium at Toronto. The Winnipeg Blue Bombers defeated the Ottawa Rough Riders 18 to 16. The 46th Grey Cup was the championship game of the 1958 season of the Canadian Football League on November 29, 1958. The game was played in Vancouver’s Empire Stadium before a crowd of 36,567. The Winnipeg Blue Bombers defeated the Hamilton Tiger-Cats 35-28. This was the first Grey Cup game to be played under the aegis of the newly formed (and present-day) Canadian Football League. The 47th Grey Cup was the Canadian Football League’s (CFL) championship game of the 1959 season on November 28, 1959. The Winnipeg Blue Bombers defeated the Hamilton Tiger-Cats 21 to 7 at Toronto’s CNE Stadium before a crowd of 33,133. It was the first Grey Cup held at CNE Stadium; the stadium, making various changes along the way, would host 11 more Grey Cup games in a 24 year span ending with the 70th Grey Cup game in 1982. The 49th Grey Cup was the Canadian Football League’s championship game of the 1961 season on December 2, 1961. The Winnipeg Blue Bombers defeated the Hamilton Tiger-Cats 21 to 14 at CNE Stadium in Toronto before 32,651 fans. It is considered to be one of the 10 greatest Grey Cup Games of all time. 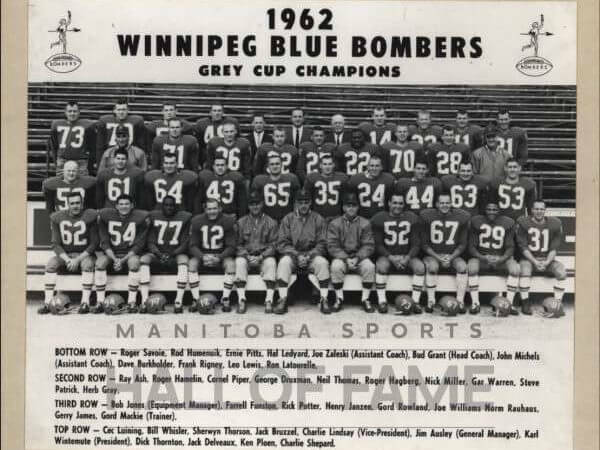 The 50th Grey Cup, also known as the Fog Bowl, was the 1962 Grey Cup Canadian Football League championship game played between the Winnipeg Blue Bombers and the Hamilton Tiger-Cats on December 1, 1962, at Toronto’s Exhibition Stadium. It remains the only Grey Cup game ever suspended during play, and the first to be finished on a Sunday. The Blue Bombers won the game by a score of 28–27. The 1962 Grey Cup game is considered to be one of the ten best Grey Cup games of all time. 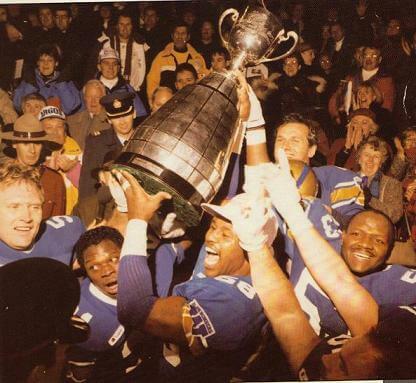 The 72nd Grey Cup was the 1984 Canadian Football League championship game, played at Commonwealth Stadium in Edmonton between the Winnipeg Blue Bombers and the Hamilton Tiger-Cats. The Blue Bombers dominated the Tiger-Cats in a 47-17 victory. The 76th Grey Cup was the 1988 Canadian Football League championship game that was played at Lansdowne Park in Ottawa, between the BC Lions and the Winnipeg Blue Bombers. The Blue Bombers defeated the favored Lions 22-21. This was the first Grey Cup game between two teams from west of Ontario, and the first to be won by a team which had only a .500 season. The 78th Grey Cup was the 1990 Canadian Football League championship game played between the Winnipeg Blue Bombers and the Edmonton Eskimos at BC Place Stadium in Vancouver, British Columbia. The Blue Bombers defeated the Eskimos, 50–11. The Winnipeg Blue Bombers (officially the Winnipeg Football Club) are a Canadian football team based in Winnipeg, Manitoba. They are currently members of the West Division of the Canadian Football League. They play their home games at Investors Group Field after many years of playing at the since demolished Canad Inns Stadium. Blue Bombers - Winnipeg was known as the Winnipeg Rugby Football Club, or "Winnipegs", whose colors were blue and gold starting in 1932. 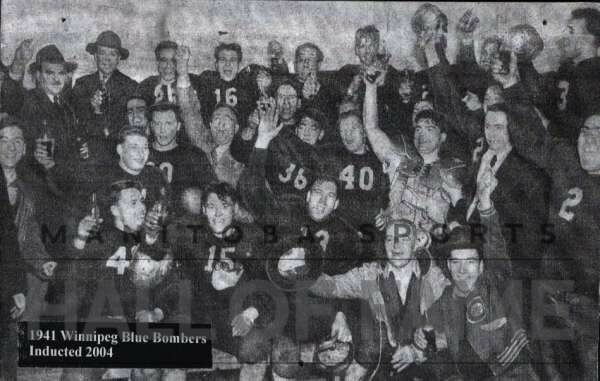 A comment by a reporter calling the team "the blue bombers of Western Football" in 1936 led the team to be called the Blue Bombers first unofficially, then officially soon after. The bomber reference was to heavyweight champion Joe Louis, popular at that time, whose nickname was the Brown Bomber. 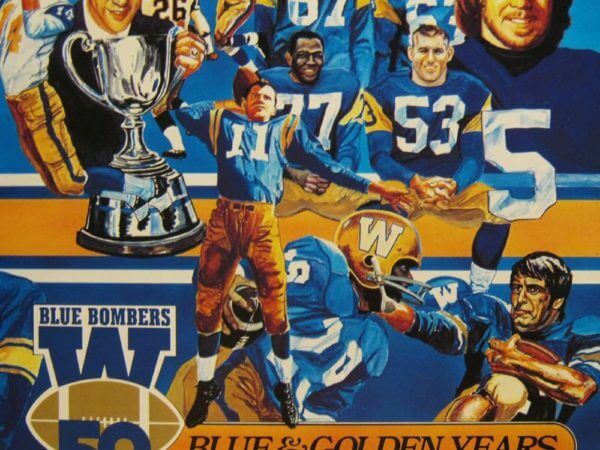 Who is the greatest Winnipeg Blue Bombers? The Winnipeg Blue Bombers (officially the Winnipeg Football Club) are a Canadian football team based in Winnipeg, Manitoba.